As mentioned on April 11th, Magne is going collaborate with young students to create a special time capsule to be kept in the Norwegian National Archives. On Tuesday this week, 17 students from selected schools across Norway, along with their teachers, took part in a workshop held at Magne’s own atelier in Asker. “This is probably the first and last time I’m having visitors at my atelier. 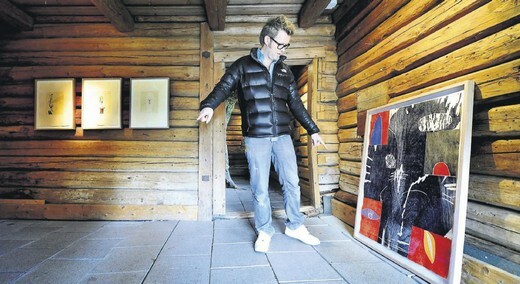 It feels a bit private”, Magne told the visiting guests before they entered, newspaper Budstikka reports. The time capsule will be formed as a sculpture, and made up of a number of metal boxes. These boxes will contain letters where students have written down their thoughts on the July 22nd tragedy and the society we live in. “I’m picturing an obelisk with words on it, maybe a sentence. You can write whatever you want – the more variation, the better”, he told his young collaborators. At the workshop he showed the students how to punch words into soft metal, which is how the sculpture will be decorated on the outside. This technique is something they are later going to show their fellow students. “You don’t often get the chance to engage people from all over the country like this. I’m a sort of facilitator here, not the creator. This is sensitive material, so I was a bit nervous. I agreed to do it because this isn’t mainly about the tragedy, but about the future. The focus here is that the students will send letters to the future, and that’s an interesting idea”, Magne says. The time capsule, which is made in connection with the upcoming documentary film Til Ungdommen, will be opened in 2031 and is described as a gift to the youth of the future. More than 50.000 Norwegian students have signed up to take part in the time capsule project so far. There is more info and a gallery from the workshop on the project’s own website at tilungdommen.com/tidskapselen. 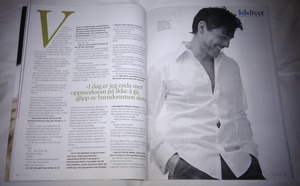 There is a 5-page interview with Morten in the current issue of Norwegian women’s magazine KK (week 21). A small preview of the interview is available at kk.no, along with a video from the photo shoot on KK’s Facebook page. There is also a selection of additional photos on photographer Charlotte Spetalen’s website. 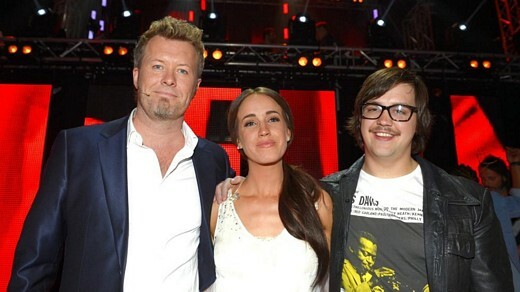 After 18 weeks of blind auditions, battle rounds and live shows – tonight it was time for the Norwegian final of The Voice, live from Chateau Neuf in Oslo. 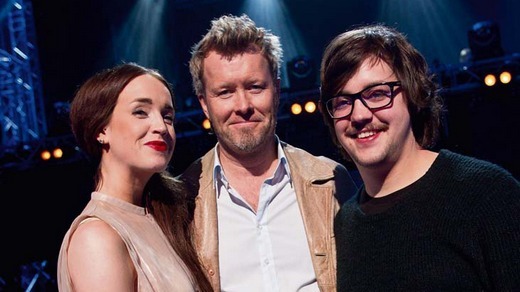 The show opened with Magne and the other mentors performing the Patti Smith song “Because The Night”, where they were joined by the four finalists at the end. There’s a video clip of it here. 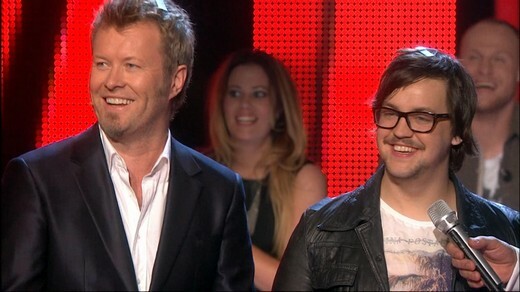 After all the votes had been collected, the winner turned out to be Martin and Team Magne – and that moment can be seen here. 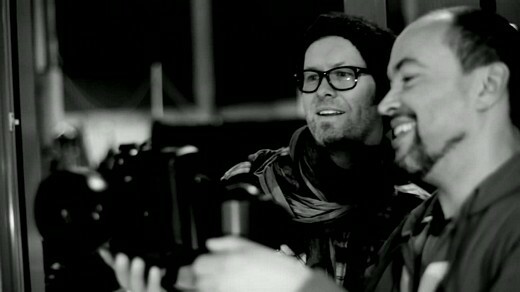 “Magne has been an extremely supportive mentor. 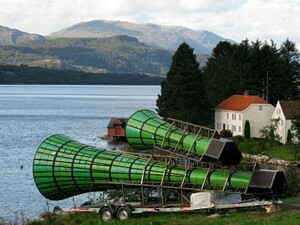 He’s been available at all hours of the day”, Martin told host Øyvind Mund on stage. As the winner, Martin gets a Lexus car and a record contract with Universal Music. Magne is sure to be involved in some way with the album Martin is going to make. But he is also planning to keep working with several of the other talents on his team. “I think we’ll make an album for people really interested in music, not an album that will be ready in time for the 2012 Christmas sale”, Magne said last week, about his plans for an album with Monika Blomeid. Magne also has plans to work more with Tini Flaat Mykland. Next month, Magne and Martin Terefe will do some recording sessions with her in Martin’s studio in London. Last night it was time for the semifinal in The Voice, with eight contestants remaining – two on each team. First up on Magne’s team was Monika Blomeid, performing her own song “London Bound”. “It’s extremely important for a vocalist and performer like Monika to become good through songwriting, write good melodies. That’s often the hard part. With this song, Monika shows that she does indeed excel in her songwriting, and that she has strength and integrity in her performance”, Magne said in his comments. Next, it was Martin Halla performing “Release Me” by Swedish band Oh Laura. The decision on who would go through to next week’s final was once again spilt between the mentors and the TV audience. Magne had the chance of giving a certain percentage of votes to his two talents, but ended up giving Monika and Martin 50% each. The final decision showed that Martin received a big majority of the votes from the TV audience, and he is the one who will represent Magne’s team in the final next Friday. He is joined in the final by Leif Anders Wentzel on Yosef’s team, Hege Øversveen on Hanne’s team and Aleksander W. Åsgården on Sondre’s team. 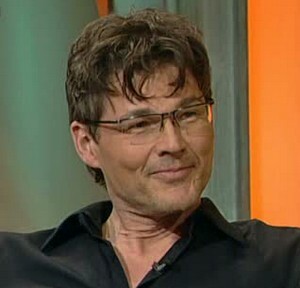 Morten was in Cologne, Germany yesterday, to be a guest on Stefan Raab’s talkshow TV Total on ProSieben. “I was in the water. I was fed up doing the regular photo shoots, and I did that with a photographer, a brilliant guy, his name is Just Loomis. He photographed us with a-ha, for the first cover we did, Hunting High And Low. So there’s a lot of history there. I met up with him in Los Angeles last year and we went for a shoot. And we ended up in the water – well, I did, anyway”, Morten said. You can see the whole 10-minute interview at tvtotal.prosieben.de (without dubbing). Magne and Heidi were among the celebrities who attended hotel investor Petter Stordalen’s annual theme party in Oslo yesterday. 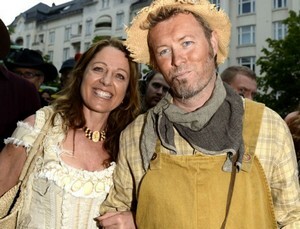 This year the party had a farmer theme. “We’re the lady and the tramp”, Magne told the press as they arrived. 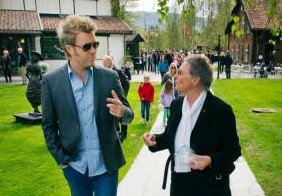 Earlier this month, Magne also attended Petter Stordalen’s opening party for the new Clarion Hotel & Congress in Trondheim, where he is one of the artists represented on the walls (see May 3rd story). 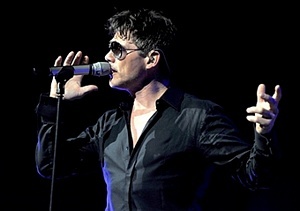 Morten’s European tour ended yesterday, with a concert at the Symphony Hall in Birmingham. The setlist seems to have been the same as it has been at 17 out of 18 concerts on this tour. Only a couple of YouTube clips so far; Out Of Blue Comes Green and Take On Me. And there’s a review from the Shropshire Star. 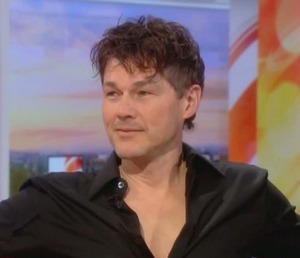 Morten was a guest on “Good Morning Sunday” with host Aled Jones on BBC Radio 2 this morning. The interview can be heard here (starts at 2:30). And Friday’s interview on BBC Radio Manchester can be heard here (starts at 0:11). But keep in mind that these BBC programmes are only available for a week or so. Absolute Radio will broadcast a 1-hour special with Morten next Thursday, May 17th. More info at absoluteradio.co.uk. Meanwhile, the Norwegian newspaper Dagens Næringsliv had a 7-page article yesterday, which followed Morten on tour in Germany last week, travelling from Düsseldorf to Dortmund, and via Peine to Berlin. 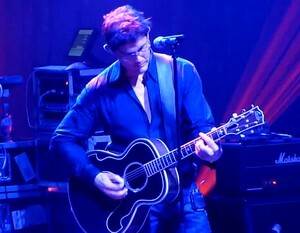 Morten started his 3-date tour of the UK at the Bridgewater Hall in Manchester yesterday. YouTube clips so far include Crying In The Rain, Stay On These Roads, Foot Of The Mountain and Take On Me. And there is a photo gallery at wireimage.com. Tomorrow he’s playing at the indigO2 in London, before this first leg of the tour ends at the Symphony Hall in Birmingham on Monday. Magne had three talents left on his team in yesterday’s live episode of The Voice, but only two of them would go through to next week’s semifinal. 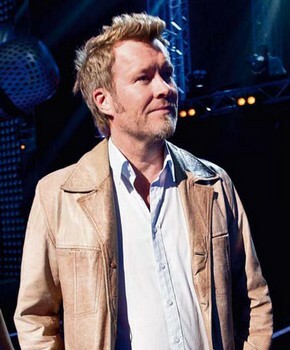 Martin received the most audience votes, and it was up to Magne who would join him in the semifinal; Shaun or Monika. “Shaun has been one of the best, all along. So in some ways this is unfair, but I hope to make it up to Shaun at a later point. (…) I hope I’ll be able to give him what I have of contacts and inspiration in the future”, Magne told VG. “You never know how the audience will vote. I have been lying awake for a few nights now, thinking about this. (…) I tried to picture who would have the most to gain from this show, that’s why I chose to keep Monika”, he added to Dagbladet. Before the show, there was a video interview with Magne on tv2.no. Afterwards he was interviewed by both VGTV and backstage in the Red Room studio. Wednesday’s concert at La Cigale in Paris included an unexpected moment, when – during “Forever Not Yours” – first the lights went out, followed by the sound disappearing. There’s a clip of it here. Thankfully, the technical problems were sorted out shortly afterwards. Check out some good quality video clips from YouTube user “vmandrant” here, and view a photo gallery from the show at photosconcerts.com. Morten played at the Ancienne Belgique in Brussels yesterday. There hasn’t been much info from this concert yet, except it was the standard setlist, but there is a video clip of “Out Of Blue Comes Green” on YouTube. You know, I wasn’t sure if Morten would be able to sing “Out Of Blue Comes Green” night after night on this tour, considering how demanding it is vocally. 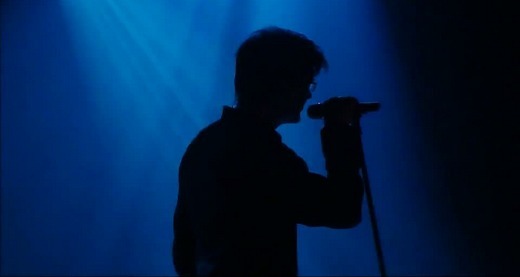 But he keeps delivering amazing performances of the song, as you can see in the clip. 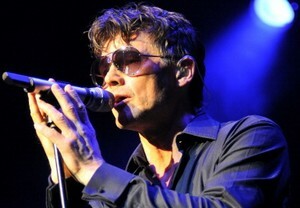 Morten’s European tour continued with concerts in Frankfurt, Düsseldorf and Berlin last week. The 19-song setlist remains the same. In the album charts, Out Of My Hands falls from #1 to #6 in Norway and from #13 to #20 in Germany in its third week. Morten played at the Volkshaus venue in Zurich, Switzerland yesterday. Video clips so far include Crying In The Rain and Lay Me Down Tonight. There’s also good picture gallery on Flickr. The book Rom 13, which I mentioned here on March 6th, was published in Norway on April 20th. In the book, 22 people talk about important turning points in their lives. 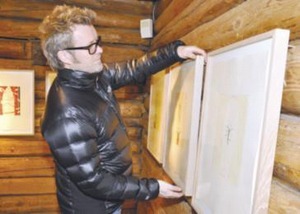 There are four pages about Magne, who talks about how his focus gradually shifted from music to visual arts. 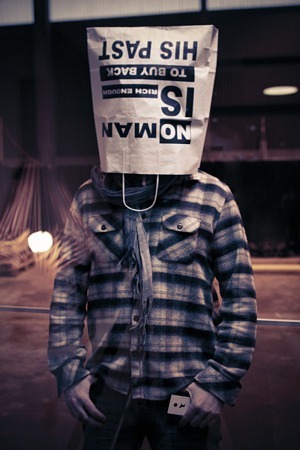 The text is accompanied by a picture of Magne, wearing a paper bag on his head with an Oscar Wilde quote; “No man is rich enough to buy back his past”. “It all begins with an idea. It begins when Paul, as a kid, asks me what I want to be when I grow up. It begins when I reply that I want to be a musician. That’s where it all begins. You vocalize it. Say it out loud. My musical activities were given such a huge outlet. I would do the other stuff alone at night, in my hotel room. I drew. Scribbled. On hotel stationary. In ring binders. Notepads. When we moved to London, I tried to sell drawings on the street to make some extra money. 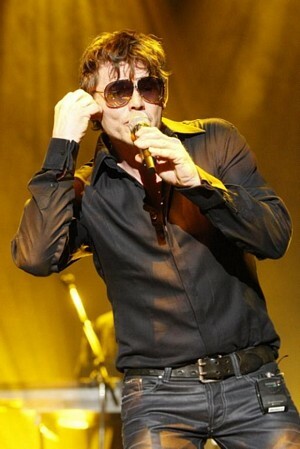 a-ha found success, and I gradually became more and more tired of fame. I sensed a need to start creating artwork again. As a form of therapy. There’s a video clip from the various Rom 13 photo shoots on vimeo. Magne can be seen at 01:28. All the photos from the book/exhibition are currently being auctioned off at fineart.no. The book can be ordered from bokkilden.no. No surprises in the setlist at the Kesselhaus venue in Munich on Monday, it seems. There are some pictures from the concert on this blog.